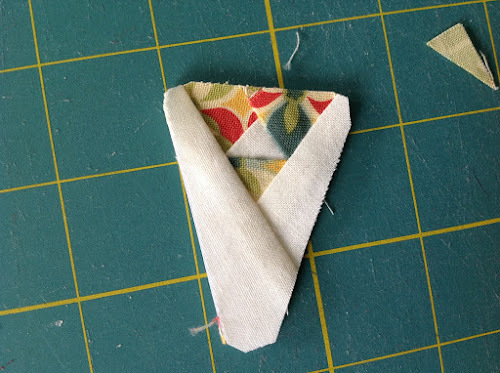 This is an easy triangle to make when doing foundation paper piecing in spite of the little tiny pieces in the pointy end. F: Three 1 in squares in blue, one 1 in square in white, one 2 1/2in x 1 1/2 in white and one 1 3/4 x 1 in in white. E: One 1 3/4 in white; three 1 3/4 in in blue; two 1 1/4 x 2 1/2 in in white. D: Two 2 1/2 in x 2 1/4in in white; one 2 in square in white; two 2 in square in blue (to cut into 3 triangles). C: Two 3 in square in white; one 4 in square in blue. B: One 3in square cut into 2 triangles in white (for B5 and A 5 pieces); one 2 1/2 in square cut into 2 triangles in blue; one 2 1/2 in square cut into 2 triangles in white. A: Two 2 1/2 in square cut into 3 triangles in blue; one 2 1/2 in square cut into 1 triangle in white. When I saw the pieces in section F of the block I thought it was going to be most difficult part. As it turned out it wasn’t. 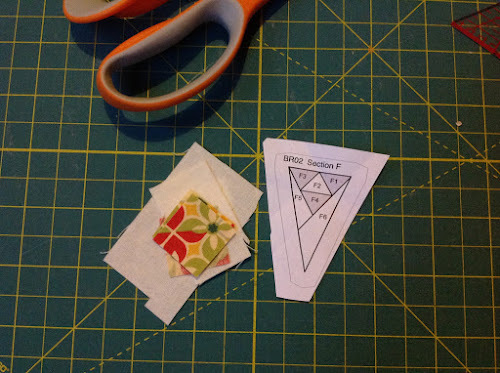 Done with patience and cutting the pieces with ample margin I was quite successful in the end. 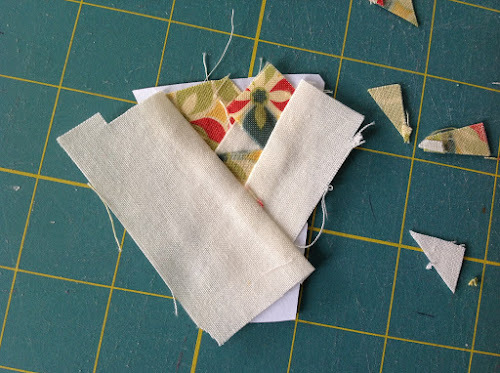 And most importantly, pressing each piece after stitching it to the previous one is essential. I can’t emphasise enough how important it is to press each piece. My blocks look a lot better since I started pressing between pieces. After all pieces are completed it’s time to put them together. And then it’s time to remove the paper. You can see how tiny the triangles are on the photo. Another win! I was thinking if you turn this block upside down, you’d have a great little Christmas tree! You’re right Carol. And the Christmasy colours help. Hi Teresa, firstly thank you for your Dear Jane posts. I started mine at a similar time and have found your posts very helpful. I have completed 3 rows and have started thinking about QAYG them before I move on. 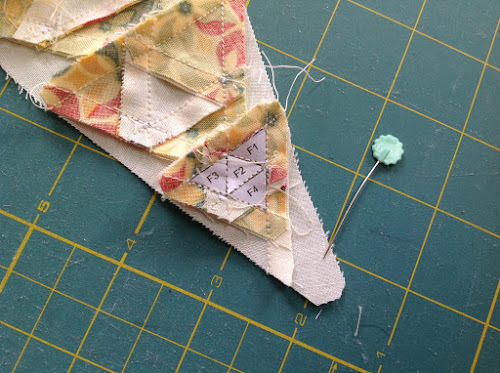 I just wanted to ask if you are planning to QAYG the pieced triangles and filler triangles and how to attach them to the quilt body. I have read this step can be a bit difficult to keep everything lined up. Thanks. You’re more advanced than me! Great that my posts have been of help. I’ve always wondered if anyone is reading them. 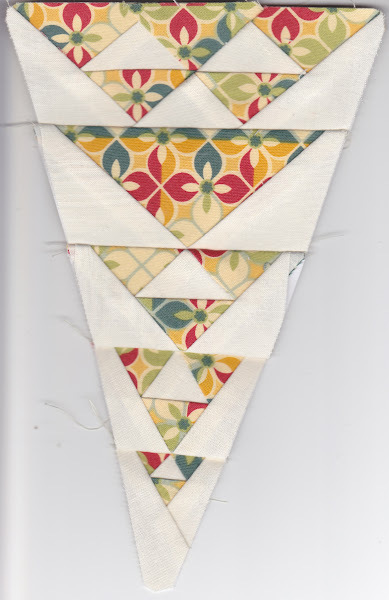 I have been thinking about what to do with the triangles and after some advice I got from someone else who did individual pieces in QAYG, and had lots of trouble with it, I’ll piece all the triangles together and will quilt each border as one single piece, including one corner per border I guess (that’ll be interesting). Then attach to the rest of the quilt with sashing as I’ve done with individual blocks. That should work I think. 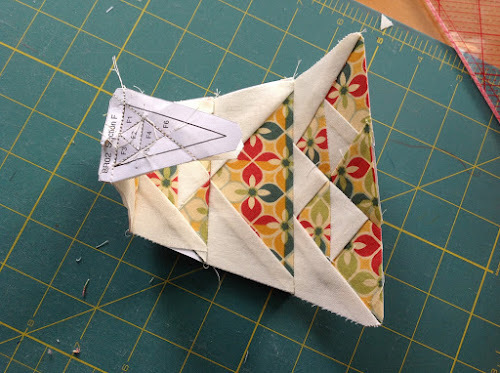 The only thing I haven’t quite decided yet is whether I’ll add a scalloped edge or not. 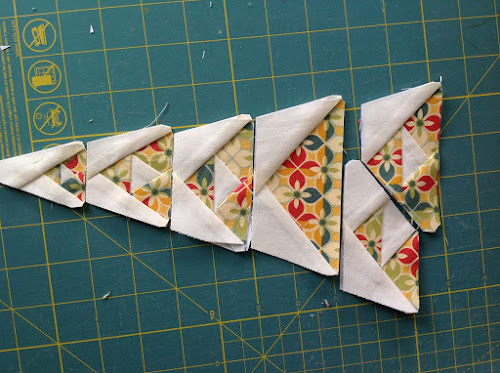 I’ve always wanted to add a scalloped edge, I think it looks quite pretty but I haven’t decided one way or another. I have so many blocks to do before I get to the adding a scallop that who knows what my thinking will be by then! That’s good, thanks Teresa – that’s how I’ve been thinking about doing the border as well. I am also hoping to do the scallops but that’s a long way away! I haven’t started any triangles yet but really enjoying the foundation paper method. Thanks again and keep up your beautiful work.